Improve the sustainability of your small business in 2017. Do you want your business to make a change for the better in 2017? Becoming a socially responsible business seems like it is only for the big companies that have large teams and financial budgets. But there are solutions available to small and medium sized businesses, which won’t add any additional strain. Here are a few inexpensive ways to improve the sustainability of your small business, without it having a major impact on your business’s finances or operations. Upgrade to energy efficient light bulbs. No matter what kind of business you run, at least 15% of your energy costs will come from the consumption of artificial light. By upgrading to energy efficient light bulbs such as LEDs, your business can save up to 60% in energy consumption costs. LED lights are more expensive to purchase initially when they are compared with traditional incandescent light bulbs. The true savings are seen over the lifespan of the bulbs. LED light technology retains and uses up to 90% of the heat energy that is lost when laminating incandescent bulbs. Upgrades can be completed to your workplace in a matter of hours or days, without disruptions to your daily operations. Additionally, there’s government subsidies available to help small businesses make the upgrade. Partner with an ethical printer cartridge supplier. Ink cartridges are becoming a huge problem for the environment. Instead of them being distributed via the right recycling channels, they are often discarded as regular waste and end up in landfill sites. The problem is that these printer cartridges take between 400 to 1000 years to decompose. Furthermore, the chemicals within the cartridges contain cancerous carcinogens, which can contaminate ecosystems and expose people to serious health risks. A small business can partner with an ethical ink cartridge supplier like Cartridges Direct, who maintain a close recycling relationship with Cartridges 4 Planet Ark, who collect and distribute the waste to be recycled by ethical recyclers. Lease an environmentally-friendly premises for your business. 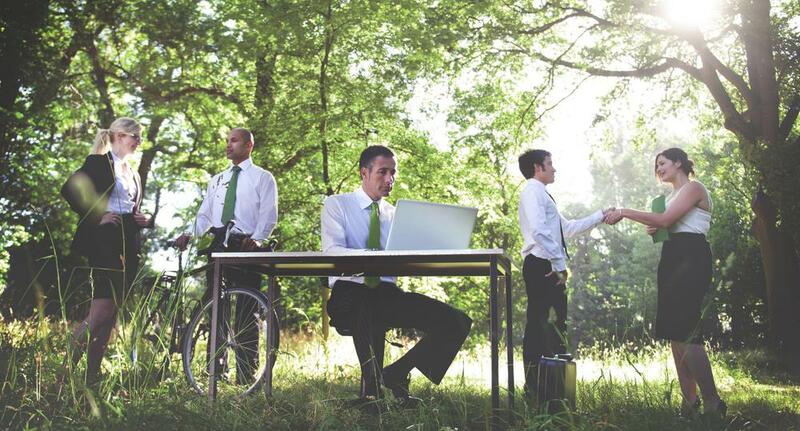 There are more green offices springing up and saving businesses a bundle on costs. The biggest factors tend to be the use of natural light, energy-efficient lighting and heating. Green-friendly offices will maximise the amount of sunlight from natural daylight, which can save up to 50% on energy bills. The abundance of natural light also stimulates employee productivity and wellbeing. Additionally, the building’s design will retain or disperse heat to maintain a comfortable climate for people to work in. Your business should aim to be minimalist. This will reduce the amount of clutter and junk around your business premises. If your business is in an office environment, encourage staff to work remotely to minimise the carbon emissions from their daily transport. Nowadays, it is easier than ever for people to work and store important documents online, minimising the need store hard copy files or even invest in several pieces of offline equipment such as printers and fax machines. Ideally, employees should work with a powerful laptop such as a Macbook, cloud storage and a smartphone. As long as their devices can be connected via Wi-Fi and Bluetooth, they should be productive without contributing to pollution. Power conservation is important because most businesses are linked to an electrical grid that produces power by burning fossil fuel. People should already be switching off electrical items when they aren’t in use, however by investing in smart technology, it is a guarantee that your business will stop wasting energy. Consider items such as smart televisions, air conditioners, heaters and printers. These are just a few ways you can make your business more eco-friendly. With only a few thousand dollars to invest, you can make a significant impact to the preservation of the planet.